TL;DR: In this article, we will take a brief look at 15 libraries that can help us in our day-to-day Android development. With them, we will be able to create apps that perform better and that provide better user experience. "Popular Android libraries can help us create apps with better performance and user experience." Libraries are major game changers in software development irrespective of platform or stack. With libraries, we leverage the efforts of other developers to perform actions/functions faster, more effective, and with lesser boilerplate codes. In this article, we will look at various categories in Android development and the common libraries used in them. Image loading libraries come in very handy to avoid high memory consumption caused by loading multiple images at the same time. Images are the greatest source of Out of Memory errors in Android development. These libraries, therefore, reduce the hassle of loading and caching images together with minimizing memory usage to provide a seamless user experience. 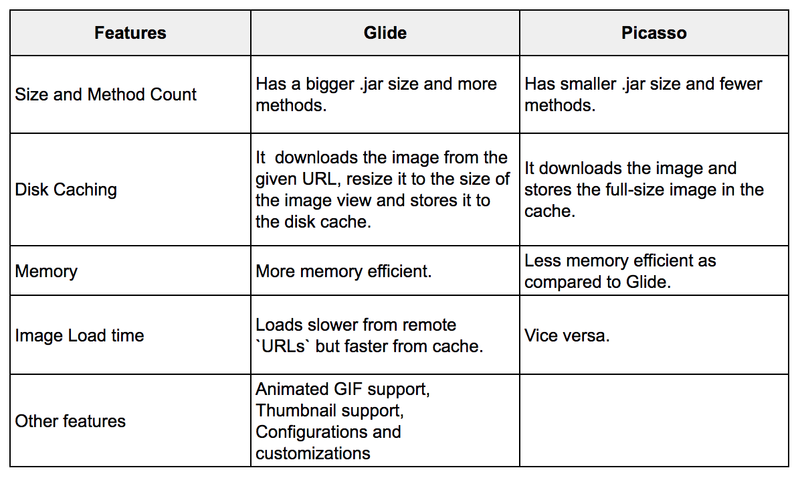 Let's take a look at two of the commonly used image loading libraries: Glide and Picasso. Glide is an image loading library focused on smooth scrolling. Glide ensures image loading is both as fast and as smooth as possible by applying smart automatic down-sampling and caching to minimize storage overhead and decode times. It also re-uses resources like byte arrays and automatically releases application resources where necessary. At the time of writing, Glide's latest version requires a minimum SDK of API 14 (Android 4.0) and requires a compile SDK of API 26 (Android 8.0) or later. The with method can take a Context, Activity, Fragment or View object. The load method takes a remote URL or a drawable file (e.g R.drawable.image). The imageView instance, passed as an argument to the into method, should be of type ImageView. Note that, if your gradle version is below 3.0, you should use the compile keyword instead of implementation to add dependencies. Picasso is another great image library for Android. It's created and maintained by Square, a company that is heavily dependent and contributor to the open source world, that caters to image loading and processing. By using Picasso, the process of displaying images from external locations is simplified. Picasso supports complex image transformations, automatic caching to disk, ImageView recycling, and download cancellation in an adapter. The library handles every stage of the process. It starts by handling HTTP requests and also handles the caching of the image. Just as Glide does. As we can see, the API provided by Picasso is very similar to the one provided by Glide. Over time, there has been series of arguments and controversies as to which library performs better. Below is a table showing the strengths and flaws of them both. Displaying videos poses to be another difficult task during development. The process and details to take care of can be too numerous to handle. In this category, there are a few available options. However, as the most popular and powerful one is ExoPlayer, we will focus this section on it. ExoPlayer is an Android media player library developed by Google. It provides an alternative to Android’s MediaPlayer API for playing audio and video (both locally and over the internet) with some added advantages. ExoPlayer supports features not currently supported by Android’s MediaPlayer API, like DASH and SmoothStreaming adaptive playbacks. One of ExoPlayer’s biggest advantage is its easy customization. With this, we have a basic implementation of ExoPlayer. Google provides a great tutorial with more information on how to get started with this library. Nowadays, virtually every mobile app needs some sort of network communication to perform one function or the other. Previously, if we wanted to make a network request, we would have to execute an Async task class and use HttpsUrlConnection to fetch data. However, this is not very effective especially when we are dealing with APIs that return large data. Luckily for us, there are great networking libraries available to help us optimize this process while managing threads and the device’s resources properly. Among the alternatives, there are two that stand out: Retrofit and Volley. As Retrofit is the most popular between the two, let's take a look at it. Retrofit is a type-safe HTTP client for Android and Java developed and maintained by Square (the same company that supports Picasso). Retrofit is the most used networking library in Android development. In Retrofit, with just annotations, you can easily add a request body, manipulate endpoints, manipulate headers, add query parameters, and choose request methods. Retrofit also handles parsing to POJOs very well by using converters. We would also need to insert dependency for converters that we intend to use. Converters handle the mapping of Java objects to the response body. You can read more about converters here. From the snippet, we have an endpoint /data that requires a JsonObject @Body for the request. We also have a ResponseClass which will be mapped to the expected response body of our request. However, the class is omitted here for brevity. To map JSON objects to POJOs, we can use the JsonSchema2Pojo library. Where jsonObject contains the request parameters. This request will be made to the http://127.0.0.1:5000/data endpoint, as defined in the previous code snippet. As we can see in this last snippet, Retrofit also provides us callback methods to give us the status of the request. Dependency injection is a concept where an object does not need to configure its dependencies. Instead, dependencies are passed in by another object. This principle helps us to decouple our classes from their implementation. It is worth noting that this is a good software engineering practice because it makes our code loosely-coupled, which makes it easier to maintain and test. There are a number of dependency injection libraries but Dagger2 seems to be the lord of them. Dagger2 is a fully static, compile-time dependency injection framework for both Java and Android. It is an upgrade to the earlier version (Dagger1) created by Square that is now maintained by Google. The recent Dagger version includes Android specific helpers for Android. Specifically, the auto-generation of subcomponents using a new code generator. Dagger2 is very deep and may require just more than the brief sample usage for adequate understanding, but let's take a look at it anyway. After that, we can create an activity builder module class to enable Dagger create sub-components for the activity that will need dependencies. We can also create another module class to provide dependencies to be used beyond just one activity class. We had to create an instance of DispatchingAndroidInjector<Activity> and return it in the implemented method. The reason for this is to perform members-injection on activities. Then, we built our Component and injected the Application class into it. We did something similar to what we did in the App class. The only difference is that we are implementing HasSupportFragmentInjector so the DispatchingAndroidInjector<T> has Fragment in its type now. The logic is this: the Application will contain Activities, and these will house Fragments. Thereafter, we called AndroidInjection.inject(this) in our onCreate method. View binding libraries emerged when there was a need to reduce the boilerplate code when assigning views to variables and having access to them in the activity class. Libraries in this area are limited. Basically, there are two that worth mentioning: ButterKnife and Android Databinding. ButterKnife is a view binding library developed by Jake Wharton. Butterknife is a library that helps us assign ids to views easily thereby avoiding the excess findViewById. According to the documentation, “Butterknife is like Dagger only infinitely less sharp”. This means that view binding can be seen as a form of dependency injection. In ButterKnife, annotations are used to generate boilerplate code for us instead. We can access the full documentation of ButterKnife here to explore more functionalities of the library. The Android Databinding Library is inbuilt to the Android Support Library. It requires at least Android studio version 1.3 to work. This library, unlike ButterKnife, does not make use annotations. An activity binding class is then generated for us (ActivityMainBinding) based on the naming of the layout: activity.main.xml. We will use an instance of this class to access our views. We also have another class, DataBindingUtil, generated to handle other utilities. The Android Databinding Library offers a replacement for onClick listeners together with a whole lot of other features. These features can be found in the official docs. These two libraries, ButterKnife and Android Databinding Library, significantly reduce the amount of code written to access views. However, the Android DataBinding library looks like a winner here because it is easier to setup, it achieves the result with fewer code as compared to ButterKnife and offers more functionalities. Reactive programming is a paradigm where data is emitted from a component (a source) to another component (a subscriber). This helps us to handle asynchronous tasks effectively. Reactive programming libraries are, therefore, libraries that help in passing the data from sources to subscribers. The most popular alternative available for Android developers is RxJava2 and RxAndroid. As such, let's take a look at them. RxJava is a library that lets us implement reactive programming and, as such, create reactive applications. RxJava2 is an update to the earlier version of RxJava. In RxJava2, we have Observables, Observers, and Schedulers. Observables are the data sources and they exist in various types: Observer, Single, Flowable, Maybe, and Completable. Each of these types has a unique use case which we can read more about here. Notably, the Flowable comes with a backpressure support. Backpressure is when an Observer can signal to the Observable that the latter is emitting values too fast. Observers are the data receivers (or consumers) while Schedulers help to manage threads. RxAndroid, on the other hand, is an extension of RxJava2. It offers functionalities just peculiar to the Android platform, like the provision of a Scheduler that schedules on the main thread or any given Looper. In the code snippet above, what we added to our disposables variable consists of the data source which will emit one string, the thread where the process will take place, the thread where our observer will be notified of the result, and our subscriber/observer. The DisposableObserver<String> is our observer, which provides us with three implemented methods. First is onNext which is called whenever data is emitted, next is onError to show that an error occurred, and finally onCompleted to show that the Observable has finished emitting data and won't call onNext anymore. There is a basic, but interesting, tutorial by Mindorks to help you get started with RxJava2 here. Testing is simply executing a software with the aim of finding bugs. Testing has evolved over time and has gone beyond just being one of the final stages of a software development process. In fact, testing could be adopted as an early part of the coding stage where tests are written first, then the logic of the software is then implemented to only pass what the test expects. This is usually referred to as Test Driven Development. It is good practice to write tests for our applications as it helps us to spot bugs quickly and enhance our application. There are a number of test libraries with different strengths available for Android development. Let's take a look at four of them: JUnit, Mockito, Robolectric, and Espresso. JUnit is a framework used for unit testing. Unit testing is a type of testing where individual units of the source code are tested. The framework contains a set of assert methods to check an expected result against the actual result. JUnit makes heavy use of annotations. Just to name a few, we have @Test (to identify a test method), @Before (to declare a method that should be called before a test is called), and @After (to declare a method that should be called after a test). Here, we checked to affirm that the addition of two and two equals four. JUnit tests are usually very fast because they run on the JVM and don’t require the device or an emulator. We can learn more about JUnit testing here. Most times, the classes we intend to write tests for depend on other classes. Configuring these classes just for this purpose can be hectic. This is where Mockito comes in. It is a mocking framework that helps us create and configure mock (fake) objects. It is usually used with together with JUnit. Here, we mocked a list, added data to it, and cleared it. We then verified that these actions were performed. We can learn more testing with Mockito in the official documentation. Robolectric is another unit testing library. The difference to JUnit is that this Robolectric was created aiming to help Android developers. Robolectric handles inflation of views, resource loading, and lots of other stuff. This allows tests to do most things we could do on a real device that have Android framework dependencies without launching a device as in Espresso. In a way, Robolectric simulates the Android SDK for our tests. With Robolectric, we do not need additional mocking frameworks such as Mockito. This is a very basic test that sets up our activity and just checks that it is not null. We can learn more about testing with Robolectric right here! Espresso is a test framework which is part of the Android Testing Support Library. This test framework allows us to create user interface tests for our Android apps. This means that, with Espresso, we can write tests that can check if the text of a TextView matches another text. Espresso tests run on both actual devices and emulators and behave as if an actual user was using the app. This test class checks to see if "Hello World!" is displayed when MainActivity is opened. From our study of the various test libraries, we deduce that JUnit competes with no one as it works together with other libraries. Espresso gives us a good platform for our user interface tests. Both Mockito and Robolectric have similar capabilities, but Robolectric achieves testing with fewer code. Robolectric also offers more functionalities like being able to test views. Robolectric also has the advantage of being supported by Google engineers. Offline data persistence is very important to enhance user experience. We usually need our applications to store important information that will be required on a next startup of the app or to make data available when no internet connection is available. As storing data is more complex than just combining key and value pairs, numerous libraries have been created to make storing this task easier in Android. In this section, we will look at one great persistence library: Room. Room is a persistence library which is part of the Android Architecture Components. Room provides local data persistence with minimal boilerplate code. It provides an abstraction layer over SQLite, thereby making it easier to work with databases in our app. This library comes with a lot of advantages such as verifying SQL queries at compile time, rejecting database queries on the main thread (except when explicitly stated while initializing the database), providing implementation best practices, etc. Room is composed of three main components: the Database, the DAO (Data Access Objects), and Entities. Each of them is co-related in order to make the library functional. The Entity class represents a database table and has to be annotated with @Entity. The variables in the class represent the columns the table will have. The DAO is an interface that contains the methods used for accessing the database. Room uses the interface to generate an implementation class for us. There are four specific annotations for the basic DAO operations: @Insert, @Update, @Delete, and @Query. Then, we have the Database class. This is an abstract class annotated with @Database and that extends RoomDatabase. This class defines the list of entities and their DAOs to be used. Next, we create our Entity class. As usual, we will go for something pretty simple. We will have two columns: id and name. The id column will be our primary key and it will be autogenerated to make every row added unique. Here, we created an instance of Person and inserted into the database. We only assigned the name because the id, as mentioned before, will be automatically generated for us. Notice that we also created a new thread to execute the query in a background. We can equally adopt the above pattern to perform other manipulating operations on the database. Google offers a nice tutorial to help us get started with this library. Almost every Android developer is passionate about the look and feel of their app. Sometimes we might need to go the extra mile into choosing a unique font for the app to give it the same feel across all devices. In situations like this, there are some libraries that can help us to use a custom font for all our texts in the app. Calligraphy is one of the most popular custom font libraries available and it is quite easy to get along with. With this library, we can easily declare a single font across our whole application or define fonts individually to a text. Thanks to the Android Support Library, from version 26 upward, we can make use of custom fonts without having to increase our app dependencies. This is so because in one way or the other we find the appcompat dependency in our build.gradle file. It is automatically added when creating a new Android project. First, we create a fonts resource folder. We can do this by right-clicking the res folder and then choose "New → Android resource" directory. After that, we have to choose font as the resource type and select OK. We then add the desired font files in the font resource directory (e.g. redvelvet). When we apply a font to our XML layout, the system picks the correct font based on the text style we used. Apart from applying the fonts in the XML layouts, we can also apply them programmatically and in multiple forms as we can see in the official docs. Another great resource about using custom fonts with Support Library can be found here. More often than not, our Android applications might need to perform operations out of the user's interaction. This requires handling tasks asynchronously and intelligently to optimize the app’s performance and the device in general. This can equally be called handling tasks in the background. Android has its own API for scheduling background tasks, JobScheduler, which comes with a drawback: it can only be used when supporting API 21 (Android 5.0) or later. Two other common options in this category are Android-job library by Evernote and Firebase Jobdispatcher by Firebase. Firebase Jobdispatcher comes at another cost which is the need for Google Play Services. However, it is compatible all the way back to API 9 (Android 2.3). Android-job combines the effort of Android's JobScheduler and Firebase Jobdispatcher to provide a firm job scheduling library. Little wonder, it has been widely adopted. Android-job is an Android library used to handle jobs in the background. Depending on the Android version either the JobScheduler, GcmNetworkManager or AlarmManager will be used. This is why this library wins the heart of all. Instead of using separate APIs within one codebase and checking for API versions to know which scheduling API to use, Android-job reduces our code size together with the stress and does this for us. This library requires API 14 (Android 4.0) or later. In the code snippet above, we tell the Job what to do in the onRunJob method. Then, we schedule a job by just calling FirstJob.scheduleJob(timeinMills) (where timeInMillis is of datatype long). The GitHub repo gives us more complex scheduling options like telling our job just to run when the device is charging, among others. "I just read an amazing article that talks about great Android libraries." Securing applications with Auth0 is very easy and brings a lot of great features to the table. With Auth0, we only have to write a few lines of code to get solid identity management solution, single sign-on, support for social identity providers (like Facebook, GitHub, Twitter, etc. ), and support for enterprise identity providers (Active Directory, LDAP, SAML, custom, etc.). In the following sections, we are going to learn how to use Auth0 to secure Android apps. As we will see, the process is simple and fast. To secure Android apps with Auth0, we just need to import the Auth0.Android library. This library is a toolkit that let us communicate with many of the basic Auth0 API functions in a neat way. After importing the library and adding the permission, we need to register the application in our Auth0 dashboard. By the way, if we don't have an Auth0 account, this is a great time to create a free one. On this screen, we have to configure a callback URL. This is a URL in our Android app where Auth0 redirects the user after they have authenticated. We need to whitelist the callback URL for our Android app in the Allowed Callback URLs field in the Settings page of our Auth0 application. If we do not set any callback URL, our users will see a mismatch error when they log in. Let's not forget to replace OUR_APP_PACKAGE_NAME with our Android application's package name. We can find this name in the applicationId attribute of the app/build.gradle file. Our Android application needs some details from Auth0 to communicate with it. 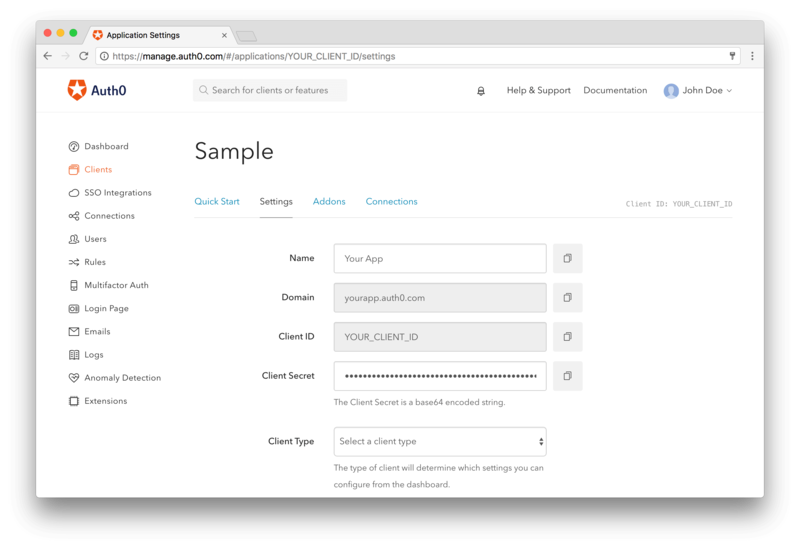 We can get these details from the Settings section for our Auth0 application in the Auth0 dashboard. It's suggested that we do not hardcode these values as we may need to change them in the future. Instead, let's use String Resources, such as @string/com_auth0_domain, to define the values. These values have to be replaced by those found in the Settings section of our Auth0 application. To implement the login functionality in our Android app, we need to add manifest placeholders required by the SDK. These placeholders are used internally to define an intent-filter that captures the authentication callback URL configured previously. After that, we have to run Sync Project with Gradle Files inside Android Studio or execute ./gradlew clean assembleDebug from the command line. The Auth0 login page is the easiest way to set up authentication in our application. It's recommended using the Auth0 login page for the best experience, best security, and the fullest array of features. Now we have to implement a method to start the authentication process. Let's call this method login and add it to our MainActivity class. If we prefer to hardcode the resources, we can use the constructor that receives both strings. Then, we can use the WebAuthProvider class to authenticate with any connection enabled on our application in the Auth0 dashboard. After we call the WebAuthProvider#start function, the browser launches and shows the Auth0 login page. Once the user authenticates, the callback URL is called. The callback URL contains the final result of the authentication process. After authentication, the browser redirects the user to our application with the authentication result. The SDK captures the result and parses it. We do not need to declare a specific intent-filter for our activity because we have defined the manifest placeholders with we Auth0 Domain and Scheme values. That's it, we now have an Android application secured with Auth0. To learn more about this, we can check the official documentation. There, we will find more topics like Session Handling and Fetching User Profile. We have seen how libraries significantly reduce the amount of boilerplate code written to perform various functions while developing for Android. We also able took a quick look on how to use these libraries in most cases. Knowing the best libraries available out there can help us improve the quality of our apps and make us produce more in less time. So, no doubt, knowing and using these libraries leads to a win-win situation.